Cannon pranks the cast of Band Vs. Band in our annual April Fool's Day strip! I'm sure a bunch of you were expecting me to get someone from the Collective of Heroes to make a cameo appearance. I definitely want to do that eventually, but I'm still catching up on a lot of their comics. There's only three that I've read fully; two I've already done April Fool's fillers with (Gyno-Star and Grrl Power), and one I have... other plans for...! Besides, Band Vs. Band is a lot of fun, and I've been dying to draw this comic for a while! If you're not familiar with it, Band Vs. Band centers around two rival band leaders: the Candy Hearts' goody-two-shoes Honey Hart, and the Sourballs' crude, vulgar Turpentine. However, their rivalry masks a mutual attraction, turning every "battle of the bands" into a battle with their feelings. With its limited color palette, retro art style, hand-written text, and borderless panels, Band Vs. Band has no shortage of eye candy, but it's the story and characters that you'll truly fall in love with. Check it out through my Links page. Many thanks to Kathleen Jacques for letting me use her characters! Drawing this filler was tricky. To make the joke in the last panel work, I needed to incorporate elements of Kathleen's style into my own, most notably the color palette. The only colors she uses are shades of blue and pink, which contrast with Cannon's green-and-purple ensemble (Normally, he doesn't wear purple pants, but I stretched his wardrobe a bit to help him stand out more). Trying to emulate her lettering and rounded borders was a bit too daunting (especially for all the things I wanted to fit in the panels), so I stuck with my old fonts and borders. But I did color the letters and word balloons like Kathleen does. The final panel is chock-FULL of music-themed gags. Can you spot all of them? I'll give you a minute. Was that enough time? Okay, let's run through all the hidden jokes, starting with the audience. Despite this being one of the more detailed strips I've drawn in a long time, I managed to complete it in a surpisingly fast two days; perhaps the lack of colors, action poses, and dramatic camera angles had something to do with it...? Drawing this strip as a form of fan art has been a lot of fun. :-) If you want to get in on the fan art train, why not enter my contest? 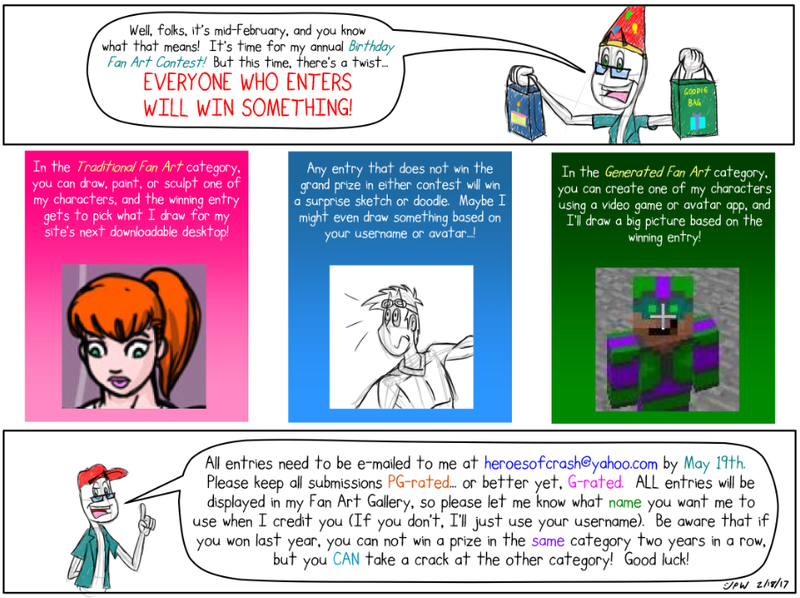 There's still over a month and a half to go, and ALL valid entries win some art as a prize! Happy drawing... and happy April Fool's Day!